Not having much luck in the area between Quail Mountain and Smith Water Canyon, I returned to looking at other improbable, but possible locations. 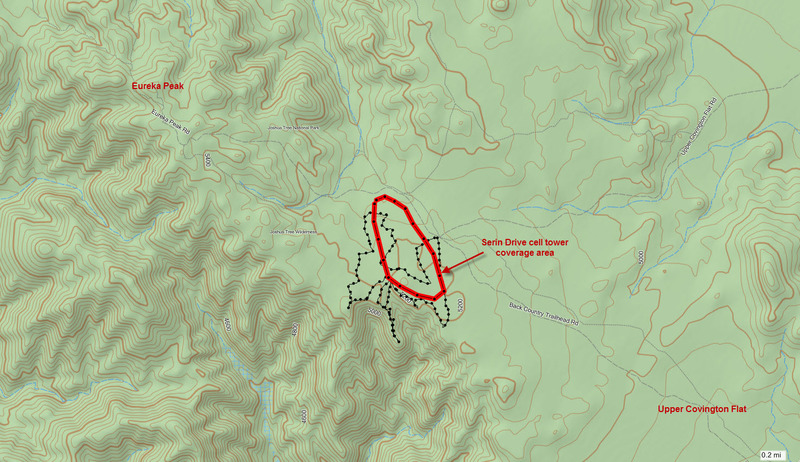 The cell coverage splash maps showed a small zone of cell coverage, almost at the 10.6 mile mark, about a third of a mile off a dirt road in the Lower Covington Flat area. Its proximity to the dirt road, which is open to vehicles and provides access to the Lower Covington Flat area, made it seem an unlikely candidate. But as before, all the likely spots had already been checked, so all we had left were the outlandish ones. This at least had easy access for a change. I had a theory that perhaps Bill could have got himself into the deep canyon to the west of this area, and exhausted himself getting out, just as he entered the cell coverage area. And as is typical for these areas we’ve been searched, no one else has looked here. Rolling, open terrain with large Junipers. To the west edge of the search area is a scary-deep canyon. I went out onto some fingers protruding into the canyon and scanned below as well as I could. From what I was seeing, It seemed unlikely someone in the canyon below would attempt a climb up, it was so steep. Heading the other way was a good downhill run, eventually coming out near Desert Hot Springs. Comments: I wish all our trips were this easy!